In Butterflies room, the children enjoyed the fresh summers air, whilst engaging in a exciting activity. The staff members thought it would be fun to fill up the tuff tray with shaving foam. The children loved watching the staff members do this. Vinnie approached the tuff tray, he seemed curious but also held back. A member of staff encouraged Vinnie to touch the foam and feel the texture, after some encouragement, Vinnie put his hand in the foam and wiped it across the wall leaving a mark. When Vinnie noticed the mark he made he said "Uh Oh" and wiped it off. 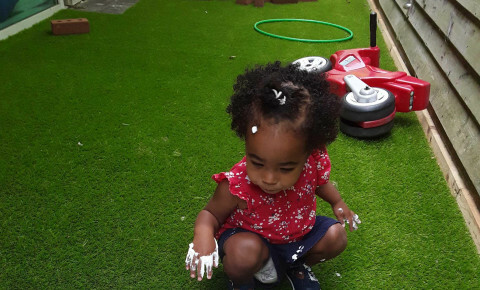 Kayla was very excited to get involved in the activity, she stuck both hands in the foam and swished them around, again, leaving marks. Olivia begun putting foam on her nose, forehead and cheeks. She was rubbing it into her skin, clearly enjoying the texture. A member of staff said "Soft" and Vinnie repeated. They then said "Smooth" and Vinnie said "Sooth". 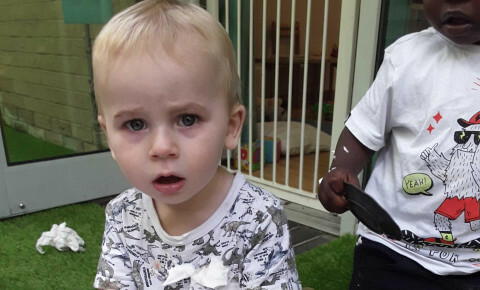 The children are gaining many things from this activity, first of all they are engaging in this activity as a group, sharing their feelings and experiences with other peers, which is supporting their Personal Social Emotional Development. Secondly, they are feeling different textures, making marks in the shaving foam and getting messy. This supports not only their Literacy Development but also their Expressive Art and Design Development. Lastly, they are repeating describing words used in the activity, which supports their Communication and Language Development. Sand Pit- Just by using and old ball pit or a big cardboard box, you ensure your child takes part in a exciting activity. Fill up the box with sand, sand toys and any other objects your child wants in their. Allow them to feel the texture of the sand, create sandcastles and add water to see the texture change. 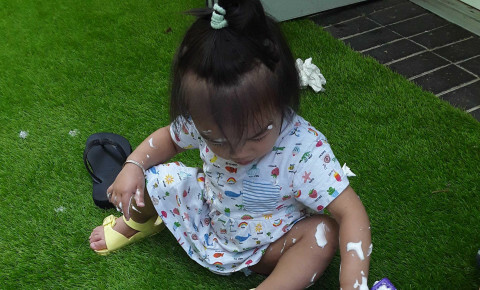 Cornflour Play- Cornflour play is very exciting for children because it isnt often they get to see it. They can feel two different textures whilst engaging in this activity, first of all, when the cornflour is set it feels hard and rough. When the child then picks the cornflour up, it turns into liquid and runs between their fingers.